We’d love your help. Let us know what’s wrong with this preview of The Best Small Fictions 2017 by Tara Lynn Masih. 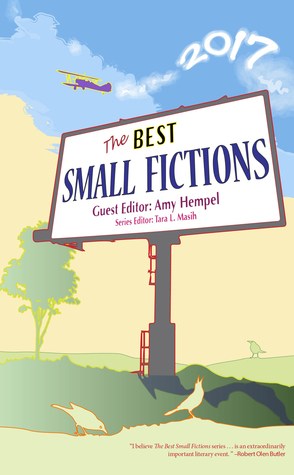 The Best Small Fictions 2017 offers readers 55 exceptional small fictions by 53 authors. This acclaimed new annual series, hailed as a “milestone for the short story,” continues to honor contemporary masters and emerging writers of short-short and hybrid forms from across the globe. Guest editor Amy Hempel chose the winners from a pool of 105 finalists: “They conjure and s The Best Small Fictions 2017 offers readers 55 exceptional small fictions by 53 authors. This acclaimed new annual series, hailed as a “milestone for the short story,” continues to honor contemporary masters and emerging writers of short-short and hybrid forms from across the globe. Guest editor Amy Hempel chose the winners from a pool of 105 finalists: “They conjure and seduce, they startle and haunt, they are funny and searing, short and shorter.” The 2017 volume includes Pamela Painter, Brian Doyle, Ian Seed, Frankie McMillan, Karen Brennan, Stuart Dybek, and W. Todd Kaneko, and spotlights Joy Williams and SmokeLong Quarterly. To ask other readers questions about The Best Small Fictions 2017, please sign up. Why did you write a book like this? What inspired you to write this book? The Best Small Fictions 2017 is guest edited by Amy Hempel. Hempel is a former student of Gordon Lish, in whose workshop she wrote several of her first stories. She has produced three other collections: At the Gates of the Animal Kingdom (1990), which includes the story “The Harvest”; Tumble Home (1997); and The Dog of the Marriage (2005). The Collected Stories of Amy Hempel (2006) gathers all the stories from the four earlier books. Tara Masih, the series editor, has won multiple book awards as editor of The Rose Metal Press Field Guide to Writing Flash Fiction, and The Chalk Circle: Intercultural Prizewinning Essays. She is the author of Where the Dog Star Never Glows: Stories and has published fiction, poetry, and essays in numerous anthologies and literary magazines. Masih also provided the quote at the top of the page in her introduction. Small fictions strive to complete the same result. They create complete experiences with a minimal amount of words. This year’s edition features fifty-three writers with two returning contributors Kathy Fish and Robert Scotellaro. Last year’s guest editor, Stuart Dybek, and roving editor, Tara Laskowski, each contribute to this year’s fictions. Also featured is an interview with Joy Williams, who contributes two works and an interview with the managing editor of SmokeLong Quarterly, Christopher Allen. This year also features a wide variety of contributing publications from Ellery Queen’s Mystery Magazine, The Baltimore Review, Steel Toe Review, and many others. Some I also know well from my other readings such as Unknown Press, University of Iowa Press, and Tahoma Literary Review. You said talking to plants gives them life, not because they hear you but because they feed on your breath. It doesn’t matter why a thing works, so long as it does. Some writings make me feel old. Ras Mashramani writes of a video game that I had to look up. Others write of a youth that was far different than my own, which was set firmly in the last century. Nick Admussen does deliver some relief with a rotary phone and a healthy dose of discovery. Missing in this anthology is the “Tweet” sized fictions. It seems that the writing has gotten longer in this edition. Fictions like Mona Leigh Rose’s take up three full pages, but are very well worth reading and have no wasted words. Matthew Baker also contributes a longer fiction that will bring a smile to the face of a political scientist. The stories presented, or the most memorable ones, seem to have a touch of the bizarre associated with them. Alex Simand’s “Election Cycle” brings the vivid imagery of a nightmarish circus scenario that many people have experienced. There is a thread of shared experience, either real, dreamed, or imagined, that make small fictions enjoyable and triggers part of the mind that can expand the handful of words into an experience. Most people have or had an uncomfortable feeling about clowns, be it last year’s clown sightings around the country, a childhood fear of creepy circus clowns, or Stephen King’s Pennywise. It just takes a few words to bring it back into our active memory and mentally expand on it. Just yesterday I read an online article that listed the writer’s favorite “very short” fiction pieces. She also mused on the idea that flash fiction was perhaps out of fashion. Through the years I’ve heard the same of any-length short stories, but that’s never been my experience. This series is proof that--to paraphrase Mark Twain--the report of the death of small fiction is an exaggeration. As with the earlier two volumes, though quality is consistent, the works are satisfyingly varied. Just to Just yesterday I read an online article that listed the writer’s favorite “very short” fiction pieces. She also mused on the idea that flash fiction was perhaps out of fashion. Through the years I’ve heard the same of any-length short stories, but that’s never been my experience. This series is proof that--to paraphrase Mark Twain--the report of the death of small fiction is an exaggeration. As with the earlier two volumes, though quality is consistent, the works are satisfyingly varied. Just to list several that stick out in my mind, though there’s plenty more I loved: the sick absurdity of Alex Simand’s “Election Cycle” and Matthew Baker’s “The President’s Doubles”; the matter-of-fact spirituality of Stuart Dybek’s “Ascent”; the one-moment-can-change-a-person of W. Todd Kaneko’s “Metalhead’s Pledge”; the pointing-out-that-racism-is-everywhere of Oscar Mancinas’ “Tourista”; the powerful poignancy of Cole Meyer’s “Nightstands” and Hannah Harlow’s “The Farmers’ Market”; and the final piece, probably my favorite, by Brian Doyle, “My Devil”, capturing in two pages how it is to be a young child in a big family, negotiating what is said (but likely means something different) and what is unsaid but becomes known—which I just realized describes all of the best small fictions. I received an ARC of this book from the editor. This has not affected my review. This is an excellent collection of small fictions, short fictions. I have come to appreciate this form so much since I was first introduced to it by Tara Lynn Masih a few years ago. To have the skill to tell a story, convey emotions so fully in such a short space and to have it be complete, complex, a full experience, is amazing. There are so many stories I enjoyed or was moved by. One of the most powerful was "Don't Walk" by Joy Katz. Initially I was confused and then I was there with the writer This is an excellent collection of small fictions, short fictions. I have come to appreciate this form so much since I was first introduced to it by Tara Lynn Masih a few years ago. To have the skill to tell a story, convey emotions so fully in such a short space and to have it be complete, complex, a full experience, is amazing. There are so many stories I enjoyed or was moved by. One of the most powerful was "Don't Walk" by Joy Katz. Initially I was confused and then I was there with the writer, the action and Wow! Harriot West's "Picking Sunflowers for Van Gogh" offered me another way to think of that man's world. In Eugenie Montague's "Breakfast" there is a tired young mother desperate to save face. "The Atheist of Dekalb Street" by Christopher DeWan is one of several works that bring together old and young in unexpected ways. Emily Corwin's "Bildungsroman" is a nervous twist of fairy tale. "Bass Weather" by Michael C. Smith has my favorite line from the book (and one I wish I had thought up): "We had entered the valley of monosyllabic utterances..." (p 144). Last, but not least, I was happy to read a work by Brian Doyle, "My Devils", a story of family, communication and love unspoken. I join so many others in missing him. This really is a very good collection that I recommend to anyone who enjoys this form and also to those who would like an introduction. (3.75) Now in its third year, this anthology collects the year’s best short stories under 1,000 words. Starting with a zinger of a first line is one strategy for making a short-short story stand out, and there are certainly some excellent opening sentences here. Symbols and similes are also crucial to conveying shorthand meaning. Two stand-outs are “States of Matter,” Tara Laskowski’s deliciously creepy story of revenge aided by a gravedigger; and Matthew Baker’s “The President’s Doubles,” in wh (3.75) Now in its third year, this anthology collects the year’s best short stories under 1,000 words. Starting with a zinger of a first line is one strategy for making a short-short story stand out, and there are certainly some excellent opening sentences here. Symbols and similes are also crucial to conveying shorthand meaning. Two stand-outs are “States of Matter,” Tara Laskowski’s deliciously creepy story of revenge aided by a gravedigger; and Matthew Baker’s “The President’s Doubles,” in which an island nation becomes so protective of its imperiled leader that he ends up a prisoner. They’ve saved the best for last in this collection, though: Brian Doyle’s “My Devils,” in which an Irish-American boy learns how to interpret the adult world by deciphering what people say versus what they mean. It’s remarkable how concisely a coming of age and loss of blind faith are conveyed. Although there are fewer overall highlights than in the first volume, this is an excellent snapshot of contemporary super-short story writing, recommended for story lovers and newbies alike. I was so excited to get the opportunity to review an early release of The Best Small Fictions 2017 edited by Amy Hempel (One of my favorite sentence makers! Get her Collected Stories right now!) and Tara L. Masih. And thanks to Braddock Avenue Books for taking the reins to publish this third volume of the anthology which I’ve been loving since before the first one. I LOVE Flash and Microfiction and was very very pleased to find several wonderful pieces of Microfiction in this edition! In fact I’ll stick my neck right out and say that my choice for the best story in the book is What Remains by Robert Scotellaro. My god what an amazing piece of work that captures all our lives, right here, right now; our fears, our hopes, our delights in a perfect little 100 word gem. Amazing! This third volume is again chock full of great stories. Having just re-read them all to prepare this review I can see many that I did not choose to mention could just as easily have a spot here. I don’t think there is a ‘bad’ story in the bunch. Wonderful stuff and I do hope this series continues for many many years under the new leadership and publisher. Thank you Tara for your wonderful work on these! I’ll be looking forward to the Sherrie Flick release next year. I love her writing (Oklahoma Men! OMG!! I've read and re-read and studied and re-read and all but memorized it :) ) but for now, on with the show. What the Beach Tree Knows by William Woolfitt – a surreal and mesmerizing tale of empathy and loss. Sisters by Heather McQuillan a perfect little Microfiction (92 words) of a wonderfully deranged family. Killerman by Michael Hammerle a totally knot in the stomach thriller of sorts in less than 1000 words. Read it! You’ll love it! We are all Relatively Safe Here by Cameron Quincy Todd a creepy tale of sisters, bunnies and getting to know one’s neighbors. tree rot by Alvin Park – what would you do for one your loved with all your heart? Summer by Keith Woodruff a story of childhood summers and the changing of the light. Nightstands by Cole Meyer if I had to choose a runner up for my top choice this would be it. Another microfiction that captures an entire life, love and loss in 148 words. The Last Fragile Thing by Erin Calabria another story of loss somewhat unstated but burning like a fire, always but gentle as a bird. (which reminds me there are quite a few bird stories in the volume :) ). In Our Circle by Kimberly King Parsons a quite interesting perspective on keeping an iron grip on one’s sanity whatever it takes. Registry by Phillip Sterling an interesting take on wedded bliss. What a Beautiful Dream by Randall Brown – a somewhat bizarre tale of a lost daughter and a doll made to replace her. Sea Air by Matt Sailor a tale of the future, rising waters, and fear that comes in at under 250 words. The Atheist of Dekalb Street by Christopher DeWan – An interesting take of religion and society. The Things We Lose by Frankie McMillan the ultimate story of loss, keys, marbles, and more. The Truth about Distance by Gen Del Raye a story of horseshoes, hand-grenades, touching and the distance between us. Bildungsroman by Emily Corwin a fairytale story of what can happen. Metalhead’s Pledge by W. Todd Kaneko a coming of age realization. Waste Deep at Hapuna by Jesse Goolsby a story of rebellion, parenting, life. The Farmers Market by Hannah Harlow what it is to be a parent. I remember this one vividly from my first reading in SLQ so was very glad to see it here as well. So there you are my twenty-two selections …. not quite half … of the fifty-five wonderful stories in this volume. I’m hoping for many more years of wonderful stories like these! A lot of work goes into this series. And we love the writing that we get to give a special nod to. This is my last year as series editor. It's been quite an experience setting this up, designing it twice, and bringing it out into the world for you readers. Thanks to all of you who helped make it a small press bestseller. As one of our reviewers says, each story is a "mini-masterwork." Hope you will check it out and judge for yourself. My general thoughts about the Best Small Fictions series are probably no secret. I’ve called both BSF 2015 and BSF 2016 the most important books published in their respective years. The most important book published this year is now and will prove to be Best Small Fictions 2017. Now that’s we’ve established that once again, I will say this year has been a particularly good year for flash fiction. The New Yorker has decided to publish flash stories throughout the summer (t My general thoughts about the Best Small Fictions series are probably no secret. I’ve called both BSF 2015 and BSF 2016 the most important books published in their respective years. This year the selections are as strong as ever. The usual cast is present with veteran flash fiction authors such as Scott Garson, Jen Knox, Randall Brown, and Sherrie Flick, among others, while also peppering in some iconic short-short form writers like Joy Williams, Stuart Dybek, and Robert Scotellaro. But don’t let these big names and longtime flash writers lead you too far afield from the others included in BSF this year. The talent is spread around. She continues the story and gives the reader a marriage of the beautiful and practical, along with strange tradition and other-worldliness. Another story as deserving for inclusion in this year’s edition is the flash piece “Silent Hill” by Ras Mashramani, originally published in Pank. Mashramani takes a Playstation game from the late 1990s and creates a flashback world to when the character lost herself in the game while escaping a world in which her father was dying. We are firmly placed in this world of father and daughter, both in the context of the video game and also the reality of the story. And when we find later on that the character finds herself allowing a boy much older than her named Marquise to live out a young lapgirl fantasy while she loses herself in the game, it’s both a revealing and a supremely sad moment. But more than that it’s a brilliant technique and wholly original, even for a form that is innately original in nearly any and all concepts of fiction. When a story stands out in such a way, it’s no surprise to find it between the covers of BSF. It is amazing to me how big a story can come from such very small fictions . A perfect book to bring to work to read during my 15 minute break . I especially liked , What the Beach Tree Knows by William Woolfitt , The Farmers Market by Hannah Harlow and My Devils by Brian Doyle . As a contributor to this year's BSF, I am thrilled to be among so many lovely stories in this book. I particularly enjoyed "Election Cycle" by Alex Simand, "Summer" by Keith Woodruff, and "Killerman" by Michael Hammerle. But honestly, just pick it up and open to any page and you will be delighted. I reviewed BSF 2016 and came away impressed by about half of the stories. I got a review copy of this book from Tara Masih this summer. After finishing this collection tonight I came away loving so many of them. Those I didn't love I still really liked or appreciated. BSF 2017 has a great range to it, full of so many styles and voices and effects. These stories evoke laughter, pain, and a variety of emotions. Among my favorites were Joy Williams' Dearest, and her Polyuretha This. Collection. Wow. These stories evoke laughter, pain, and a variety of emotions. Among my favorites were Joy Williams' Dearest, and her Polyurethane, Larry Brown's Triangle (one of my top 5 favorites), Alex Simand's Election Cycle, Len Kuntz's Summer Scalping: Scarecrows (a top 5), Ian Seed's Filer à l'anglaise, William Woolfitt's What the Beech Tree Knows, Matt Sailor's Sea Air, Christopher DeWan's The Atheist of Dekalb Street (which touches on the theme of judging others with different world views), Frankie McMillan's The things we lose, Michael Hammerle's Killerman, Cameron Quincy Todd's We Are All Relatively Safe Here, Mona Leigh Rose's The Crossing, Emily Corwin's Bildungsroman, Matthew Baker's The President's Doubles, Alvin Park's tree rot, Oscar Mancinas' Tourista, Lydia Armstrong's The November We Are Fifteen, Michael C. Smith's Bass Weather (one of my top 5 favorites), Sherrie Flick's Boiled Clear, Brian Doyle's My Devils. A splendid and varied collection of flash-fiction. Despite having published my own collection in the genre, I did not know much about it before. The TL:DR version: skip this year's edition. Read Wigleaf's Top 50 Very Short Fictions instead for exciting flash fiction. This year's edition of Best Small Fictions is incredibly disappointing. It doesn't have the same crackling energy as last year's addition and I wonder if that's because it's the same flash fiction gatekeepers imposing what they feel is truly the best flash fiction, which seemed to be shorter versions of Raymond Carver stories more so than anything else. I would challenge t The TL:DR version: skip this year's edition. Read Wigleaf's Top 50 Very Short Fictions instead for exciting flash fiction. Kathy Fish - "Strong Tongue"
W. Todd Kaneko - "Metalhead's Pledge"
Jesse Goolsby - "Waist Deep at Hapuna"
Again, another year of great small fictions collected. As I read, I started a list of all the great stories and the separate reasons they're great. I kept reading and the list kept growing and, by the time I finished the book, my list with its reasons seemed longer than the book. Read the book. It's that good. An excellent anthology exploring the landscape of flash fiction. These stories pin you down like bolts of lightning - impossibly strong however brief. Great book to teach emerging writers such as my self. There are many exceptional flash fiction stories in this series, including authors such as Joy Williams, Tara Laskowski, William Woolfitt, Michael C. Smith, Brian Doyle and more. If you enjoy short stories that make you pause, think, contemplate and consider, read this collection. The Best Small Fictions is available for 2015, 2016 and 2017. Can't wait for the next!! Tara Lynn Masih is editor of The Rose Metal Press Field Guide to Writing Flash Fiction, The Chalk Circle: Intercultural Prizewinning Essays (winner of a Skipping Stones Honor Award; a Benjamin Franklin silver medal award; and a ForeWord Book of the Year Award), and author of Where the Dog Star Never Glows: Stories. She is the founding series editor of The Best Small Fictions. My Real Name Is Hann Tara Lynn Masih is editor of The Rose Metal Press Field Guide to Writing Flash Fiction, The Chalk Circle: Intercultural Prizewinning Essays (winner of a Skipping Stones Honor Award; a Benjamin Franklin silver medal award; and a ForeWord Book of the Year Award), and author of Where the Dog Star Never Glows: Stories. She is the founding series editor of The Best Small Fictions. My Real Name Is Hanna, her debut novel for young readers and adults set in WW II Ukraine, received a FLORIDA BOOK AWARD and a SKIPPING STONES HONOR AWARD, appeared on Goodreads' 2018 Ultimate Fall YA Reading List and their Best of the Month Sept. YA list, and will be translated into Slovak. AITL Media selected her for an Inspirational Woman in Literature Award for 2019. Tara received an MA in Writing and Publishing from Emerson College, and has been widely anthologized, and her essays have been read on NPR and translated into dance. Several limited edition illustrated chapbooks featuring her flash fiction and poetry, along with poet's farthing cards, have been published by The Feral Press.